Just over two weeks ago Bolton Wanderers midfielder Fabrice Muamba suffered a Sudden Cardiac Arrest and collapsed during his team's FA Cup tie with Tottenham Hotspurs, at White Hart Lane. No surprise this tragic incident grabbed the headlines around the world and has continued to do so on a daily basis. The match was rightly abandoned, as both teams' doctors spent around ten minutes reating the 23 year old on the pitch in front of around 35,000 stunned fans and millions of viewers around the World. Those watching the drama unfold were left in no doubt that Fabrice was fighting for his life, as one of the doctors was quick to connect up a defibrillator. It is this single action that could well be the reason why Fabrice survived long enough to receive life saving treatment in hospital. European Society of Cardiology spokesperson, Professor Mats Borjesson of Sahlgrenska University in Gothenburg recently stated,. "It is well known that rapid access to the right treatment facilities can improve Sudden Cardiac Arrest (SCA) survival rates from 5% to well over 60%.'" SCA is a condition in which normal blood circulation abruptly stops and usually leads to death in 95% of cases unless the patient is treated within five minutes or so by trained medical staff using a defibrillator. 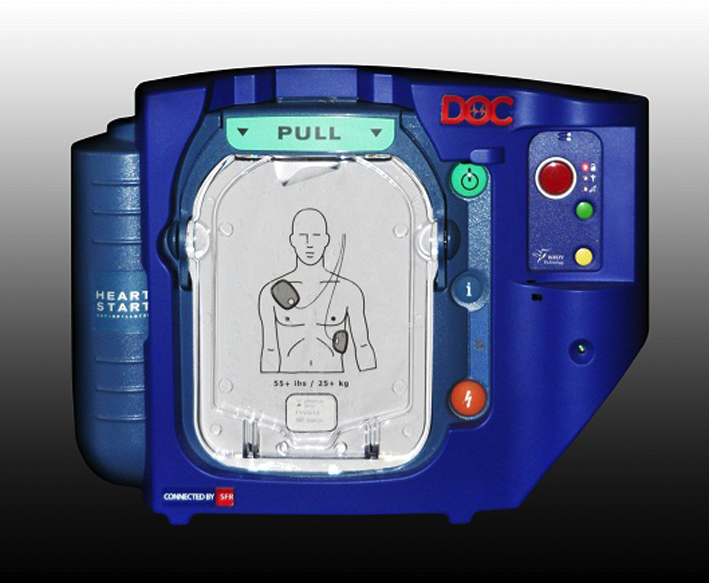 These days defibrillators are being installed in many major sporting stadiums around the world, mainly due to the efforts of the ESC, however this wasn't the case when Cameroon's Marc Vivien-Foe, 28, a premier league player firstly with West Ham and then Manchester City, collapsed and died during a Confederations Cup match against Colombia in Lyon, France in 2003.
athletes, from a wide variety of sporting disciplines, die each year from cardiovascular disorders as a result of participation in sports. Boxing is no exception, in 2003 American boxer Brad Rone, who fought such luminaries as Cedric Boswell, Vaughn Bean, Kirk Johnson, Michael Grant, Hasim Rahman, Obed Sullivan, Fres Oquendo, Kelvin Davis amongst others, collapsed and died in the ring in Cedar City, Utah, during his bout with Billy Zumbrun. Brad was hit by a Billy Zumbrun jab just before the bell rang to end the first round. He turned around to walk to his corner when he collapsed and died. A ringside doctor tried to revive him using cardiopulmonary resuscitation, but his efforts were in vain. An autopsy later revealed Rone had died of a heart attack. It's not just at events that these tragedies happen, they also happen in the gym, one such incident, a stroke rather than cardiac arrest, occurred in December 2009, when former heavyweight boxer Harry Senior was working as the sparring partner for Albert Sosnowski. On the third day of sparring Harry had a stroke, the coaches rushed to his aid but were unable to assist, due to the severity of the stroke, and called the emergency services. I'm pleased to say that Harry is as tough as they come and like Fabrice survived and is slowly but surely making a steady recovery. Reacting to Harry's plight BBBofC Southern Area Chairman Mick Collier not only instigated the 'Harry Fund' and appealed to the boxing community for their support, but also lobbied boxing gym's within the region to ensure adequate first aid equipment being to hand. Speaking earlier Mick said, Fabrice’s plight has really bought home the fact that heart attacks and strokes can affect fit people, including professional sportsmen. It also highlights the importance of having the right equipment available for any circumstance. The BBBofC have strict rules in place for fights, the medical teams are fully equipped for any situation. If Fabrice had been a boxer and this happened in the ring, I am certain that the level and speed of assistance he received would have been exactly the same. We’ve been relatively lucky, these incidents are rare in boxing but not unique. A few years ago Harry Senior had a major stroke when he was sparring. I don’t doubt that in Harry’s case that a defibrillator would have made that much difference but it would if someone had a cardiac arrest when they are in the gym. For that reason alone I would urge all boxing gym’s to have one on-site as well as have all their staff trained to use them. The TRAD TKO Boxing Gym, in Canning Town, London, is one of the few boxing gym's in the country that preempted the possible mandatory requirement for defibrillators to be installed. With some forty plus pros, including stars such as WBO Intercontinental Lightweight Champion Kevin Mitchell, British Light Welterweight Champion Colin Lynes, former British Cruiserweight Champion Leon Williams as well as Southern Area Champions Ben Murphy and Billy Joe Saunders, being based at the old school East End fight factory, the TRAD TKO is still not exactly the type of place that you would think would be pioneering such technology. TRAD TKO boss Johnny Eames though explained why they were the first to install the life saving equipment late last year. They save lives, simple as that. I don't know if I could live with myself if one of members or fighters had a heart attack here at the gym and we weren't able to help them. The key staff have been trained by the Red Cross on using the defibrillator, as well as CPR. But to be on the safe side the defibrillator we have is idiot proof, it talks you through through what steps to take, so can be used by an untrained person if needed. We all like to think it will never happen to us, but what happened at Tottenham the other week shows that it could happen to anyone, even a professional sportsman and for that reason alone it makes sense to have equipment like this on-site." The defibrillator that was installed at the TRAD TKO Boxing Gym is supplied, fitted and maintained by BST (Butler Safe Technologies) and it is their state of art DOC system, which is the world's first fully connected and operational defibrillator. Having personally been trained on using the DOC system myself I can verify that as Johnny says it's 'idiot proof', as throughout the operation there is calming voice talking you through every stage, not a recording but an actual person you can have a two way conversation with. Basically in the event of an emergency, once the DOC unit is removed from it's case a GPRS signal is sent directly to Mondial Assistance which allows the co ordinates to be sent directly to the emergency services, at the same time the emergency coordinator at Mondial Assistance makes contact through the two way speaker system on the DOC device to assist the user. Another major safety feature is that once the defibrillator is attached to the patient a full ECG (electro cardio gram) is carried out, which determines whether that person is in fact suffering from an arrest. This takes away any judgment needed by the user. BST's Sebastian Mann is clearly proud of his companies product, saying, "Johnny has it so right, it saves lives, which is the most important factor. Over a hundred and twenty six thousand people suffer a heart attack every year in the UK, this is the equivalent to one every five minutes. The biggest problem is that only 5% of cardiac or heart attacks victims actually survive outside of a hospital, unless they get adequate medical assistance quickly, really quickly. Once the attack has occurred you only have between three and five minutes to take action, every minute after that represents a 10% less chance of survival. With Emergency Services response time target in London, for a Cardiac Arrest and other Category A (immediately life-threatening) calls, being within eight minutes you can see that having a defibrillator onsite will significantly increase the chances of saving someone's life if they have a cardiac or heart attack in the gym." Those statistics make for scary reading, at the same time making it clear that essential life saving equipment such as defibrillators should be installed within all sporting facilities, not just for the sake of the sportsmen and women but also the general public that train in gyms or attend sporting events. Far sighted facilities, such as the TRAD TKO gym, have already realised the importance of having them on the premises, hopefully more will respond in the same manner to ensure that essential life saving equipment in on hand for the sake of their athletes and clientele.